How to worship the merit. 1. While coming home, I had to pay homage to the Buddha. And if anyone persuades someone to tell or invite to worship the footprint. To be dedicated to worship the footprint. 2. When he comes up, he must maintain a pure heart. Do not say or do anything that is disrespectful or disrespectful. 3. At the point of the feet. I have to admit to worship before going up to the top. When people are waiting, they will go up to the top. I do not know what to do. 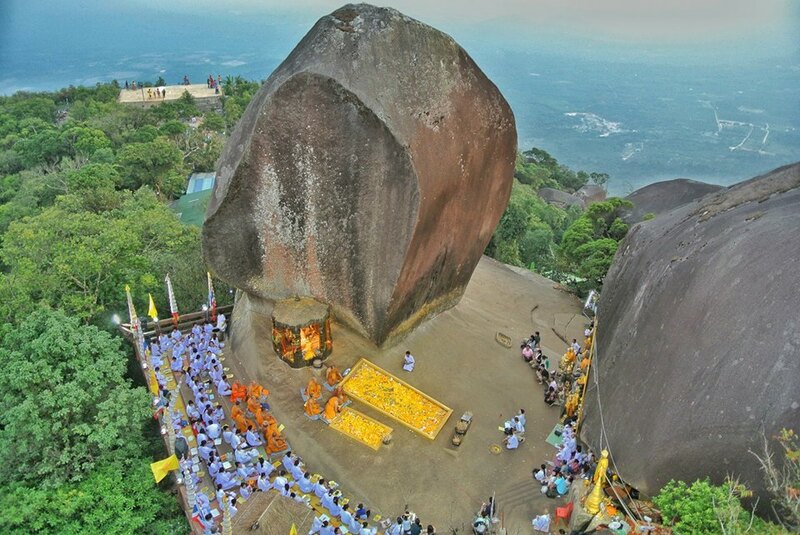 The footprint is considered to be the most sacred thing, even if the mountain is full of merit. If you do not respect the footprint. Considered a loss. 4. Give respect to your feet, such as removing a hat, removing a shoe bag, shoulder bag on the shoulder. Wear polite clothes. 5. Prepare sacrifices. For the worship of the footprints are as follows. – Flowers should be prepared specifically. Most often purchased. When traveling up, I pay respect along the way. I came to the US. I will leave the fragments. – Money, gold, money, sacrifice at the footprints. Let’s set that. The Buddha is dedicated to worship the footprint. 6. Enter into at least 3 times to be respected, because most people when they go to the great one, they are afraid that they will not pay respect to the other people. So it is time to pay close attention to the fact that the Buddha is still living in his time. Then I have 3 times. 7. Do not throw garbage at the people at the point of the feet, they pay homage. Then suddenly forget. Left a bag The paper wrapped in gold. Until the dirty feet. So throwing rubbish or debris in the feet and in the feet. 8. Garbage collection, not waste. If there is a debris from someone else’s waste. Keep it and put it in the garbage. To be kept clean. As if he was imprinted. 9. Give a blessing just one thing. The blessing that the father has written has been described. Some people come for a single request. Ignore the creation. One more People who are successful in what they ask for must have enough prestige to do what they ask for. Some people ask too much. It is a very greedy request, such as a rich hundred billion in spite of lack of prestige. This is very difficult. He taught me to ask for the right thing. And one important thing in life. I will be more successful than one. By car Sukhumvit Road At the intersection of Rai Ya Ya, turn left to Highway 3249, a distance of 24 kilometers to Khao Kitchakut National Park. Or take a minibus Chanthaburi – Chanlam. Take the bus at the post office CHALAEP Bus Station. It can be traveled from the district of Chanthaburi through Khao Rai Ya. Take Highway No. 3249, about 18 km, by the way to the Phra Bat. By the way, at each point with the park. Car parking is available. Then there is a minibus service on his feet. Exit the antimony temple to the end of the mountain. By car, the peak is divided into two fare ranges of 50 baht / person (including – 200 baht). It takes about 30 minutes to reach the foot of the footprint. For more information, please contact Khao Kitchakut National Park Tel. 0 3945 2074. Rates for individuals Go to Khao Kitchakut National Park.